A few months ago, I wrote a blog in which I likened parenting to playing a game of Whac-A-Mole. Just when we think we’ve got one facet of our child’s life under control, up pops another mole (or challenge). Perhaps the biggest mole throughout our parenting journey is the presence of consistent disrespect and/or irresponsible behavior on the part of our child. Unlike the game Whac-A-Mole, where we can simply knock the mole back into its original place with one swift blow, responding to a mole as a parent can be extremely difficult. I read an article today about a parent who chose to address one of these moles by publicly shaming both of her children. As I glanced at the follow up comments, I was shocked at the number of parents who expressed their full support of this action. Click here to read it. Although I clearly don’t agree with her parenting choice, the intent of this blog is not to condemn or criticize her. That wouldn’t serve any of us and would only add fuel to the fire. My goal is to highlight a critical distinction in the world of parenting, which has far reaching implications for our children. It’s the difference between shame and guilt. You see, each time we discipline our child it’s easy to overlook the fact that our chosen form of discipline can have a lasting impact on his/her psyche. As parents, we sometimes resort to quick-fix, punitive measures because they tend to fix a behavior almost immediately. Unfortunately, this fix is short lived and often serves as a band-aid with regard to future behaviors. The end result is a child who’s ill-equipped to deal with future challenges because of the shame they carry with them. 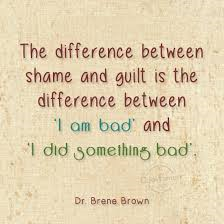 Below are three key differences between shame and guilt. An alternative response to the identical circumstance would be, “You made a mistake at school and I’d like to talk about it.” This statement clearly implies that she’s done something wrong, yet it leaves room for ownership and learning. Shame is internalized and shapes our sense of who we are. Guilt is often short term and doesn’t define us. I’ve had the great fortune of participating in various personal development workshops over the years. A common practice in each of these workshops is to introspectively look at our past and discern whether or not certain events may have shaped who we are today. On several occasions, I’ve heard grown men and women describing a specific event in which a parent, teacher, or coach said something in a critical way, which literally shaped the way they saw themselves. This is a testament to the long lasting nature of shame. Shame is synonymous with pain and suffering. Guilt is associated with accountability. In the example I mentioned earlier, my first response (You’re a bad girl) is clearly a way for me to divert the pain I may be feeling. In order for me to avoid feeling the shame of having a daughter who is acting inappropriately, I can simply pass it on to her. Of course as parents, none of these thoughts occur to us as we’re in the midst of punishing our child. Remember, a quick-fix approach is designed to eliminate the behavior immediately. What’s left, however, is the pain and suffering of shame. My second response (You made a mistake) creates an opportunity for my daughter to be accountable for her choices. Mistakes are a part of being human and it’s normal to feel a little bit of guilt following each of them. However, when we teach our children to own and clean up their mistakes, we are empowering them with a sense of accountability. No one ever said this parenting journey was going to be easy, right? If we attempt to see beyond the narrow lens of punitive discipline, we may begin to understand that each of the choices we make in response to our child’s behavior is an opportunity to equip them with tools and strategies that will serve them well in the future.